As America approached Easter last year, it seemed the 25th anniversary of John Paul II’s pontificate and the religious and commercial phenomenon surrounding the movie The Passion of the Christ had ushered in a new height for religious discussion in the news media, but it would have been easy to predict that this focus would not last. The Pope’s failing health means less headline-grabbing action, less globe-trotting evangelism, and more symbolic suffering with the burdens of age and the ravages of disease. Pre-release publicity about The Passion’s potential effect for violence and hatred was hotter and heavier than post-release coverage of the movie’s peaceful and profitable reception. Did the network news divisions predictably lose their interest in religious news topics? 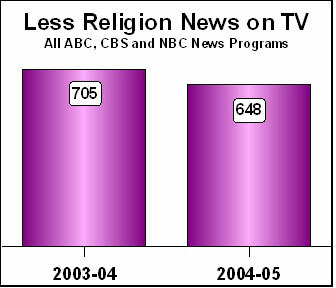 To measure the trend, MRC analysts surveyed every religion news story on ABC, CBS, and NBC news programs in the 12 months from March 1, 2004 through February 28, 2005. We then compared those numbers to the numerical highs of last year’s study of the matching months. Religion coverage is down, but not as much as might have been expected. Overall, there were 648 total religion news stories in the 2004-05 study period, down from 705 religion news stories on the Big Three last year. The real slippage came in evening news coverage, which fell from 292 a year ago to 239 this year. By contrast, the number of morning show segments was nearly the same (331 in 2003-04, down to 320 in 2004-05) and the number of magazine and interview show segments went up slightly (from 82 to 89). One major reason for the smaller-than-expected decline was Pope John Paul’s two hospital trips in February. Without the surge in Vatican stories in February, the previous 11 months contained only 175 evening news stories, which would have been close to only half of last year’s total. The morning show total would have declined by 63 stories to 257. The magazine and interview shows were almost unaffected. Depending on the poll, anywhere from 72 percent to 77 percent of Americans support posting the Ten Commandments on government property, even if they’re more skeptical about politicians taking too many cues from religious leaders, or having preachers endorse candidates from the pulpit. What bill would be introduced in Congress to “impose” Christianity? What “theocracy” is emerging? They did not explain. That disconnect on religious faith between the media elite and the public comes through on network television, no matter how routinely the religion stories are reported. Their coverage suggests that religious Americans should meet the demands of a secular orthodoxy, never daring to bring religious beliefs into the political agenda or let religious ideas influence public opinion on social issues. Even when the amount of religion news increases, the media’s tone remains wary of ancient dogmas, preferring modernist interpretations that require few changes in attitude and behavior that would set a believer apart from the popular culture, or at odds with the secular media worldview. In the last study period, the number of evening news stories on ABC’s World News Tonight, the CBS Evening News, and the NBC Nightly News rose to 292, up dramatically from the 121 news stories our first annual survey found in 1993. In the 2004-05 study period, the number of evening news stories declined to 239. Without February, it would have been 175, less than 60 percent of the last study’s story total. This total includes both the longer, reporter-based story ranging from 90 seconds to a few minutes, as well as a small number of anchor-read news bites, often about 30 seconds in length. CBS had the most stories with 98, compared to 74 for ABC and 67 for NBC. (Last year, CBS also had the most stories with 103, compared to 95 for NBC and 94 for ABC.) But in the study period, CBS also had a much higher number of anchor-read stories with 32, while ABC aired 11 and NBC aired 17. So in reporter-based stories, CBS led slightly with 66 to ABC’s 63 and NBC’s 50. Of those 179 reporter-based stories, 45 of them (or 27 percent) came in February. NBC in particular would have plummeted to only half of the last study’s total without February (from 74 full stories and 21 briefs to just 36 and 15). Part of that decline (without a comparative decline in morning news stories or magazine stories) might be attributed to the rise of campaign news in a presidential election year. But as evening news story counter Andrew Tyndall has demonstrated, the number of minutes devoted to electoral politics on the evening news in 2004 was unquestionably light in many weeks. (For example, Tyndall’s June total of evening-news coverage from Monday to Friday was 46 minutes on the three networks, little more than 15 minutes a month for each network.) Not only did John Kerry’s campaign almost disappear from the national scene in slow weeks, the networks in recent election cycles have not shown much interest in other state and national campaigns, unless a movie star is running. True to the pattern of previous MRC religion news studies, the Catholic Church received the most coverage among faiths. The Catholic Church was the subject of 60 out of the 179 reporter-based stories (35 percent), and 27 of the 60 anchor briefs (45 percent). Last year, the Catholics drew 75 out of 208 reporter-based stories (36 percent), and 53 of the 84 anchor briefs (63 percent). The coverage of the Pope’s health troubles (and perhaps the networks preparing to scramble over who would get the best access to the next papal conclave) drew a more positive tone and more church officials to the February coverage. In relation to past years, the number of stories on clergy sexual abuse headed toward the margins of coverage, with only ten full stories and 11 anchor briefs. (In the 2003-04 study, almost half of the reporter-based stories on the Catholic Church – 35 out of 75 – focused on clergy abuse scandals.) The stories centered on the conviction of Boston priest Paul Shanley, the controversy over the Diocese of Boston closing more than 60 churches due to poor attendance and financial decline spurred by the scandals, and abuse-related bankruptcy declarations by dioceses in Portland, Spokane, and Tucson. With election-year controversies over religion and politics and Supreme Court cases like atheist Michael Newdow’s complaint against a school district making his daughter utter the words “under God” in the Pledge of Allegiance, church-and-state issues came in third with 40 full stories and seven anchor briefs. For this study, the network morning shows are on a slightly uneven playing field. NBC’s Today is the air-time champion, airing seven days a week, three hours on weekdays, and generally two hours on Saturday and one hour on Sunday. CBS airs The Early Show for two hours from Monday to Saturday, and also airs the 90-minute show Sunday Morning. ABC’s Good Morning America aired only from Monday to Friday in the study period, until they unveiled weekend editions on September 4. The morning show total of 320 was divided into 216 reporter-based stories or interviews to 104 short anchor briefs. Perhaps due to its time advantage, NBC led with 82 full stories and 38 briefs (120 in total), compared to CBS with 64 and 38 (102), and ABC in third with 70 and 28 (98). NBC’s total was up from 2003-04, while CBS and ABC both declined. In last year’s study, CBS was first with 118 reports (76 stories/interviews, 42 anchor briefs). ABC was strongest on weekdays with 109 segments (76 and 33). Despite its extra air time, NBC was third last year with 104 (62 and 42). Without the numbers-boosting month of February, all three networks would have been in a more noticeable decline, with NBC posting 85 total stories, CBS with 84, and ABC with 80. As in the case of the evening shows, the larger number should be put in context — the networks are each still averaging little more than two morning segments a week in seven days of programs. The Catholic Church led the morning coverage with 122 stories (72 reporter-based stories/interviews and 50 anchor briefs), down from last year’s total of 145 stories (78 reporter-based stories or interview segments, and 67 anchor briefs). The Catholic sexual abuse story drew almost the same amount of morning coverage in last year’s study, with 14 out of 72 full stories, or a little more than a sixth of the coverage. Abuse angles carried only 13 of the 78 morning show full reports on Catholics last year. The second largest group of stories are those dealing with generic Christianity, including controversies over a tacky Nativity scene at Madame Tussaud’s wax museum in London, and new trends like Nelson Publishing’s “Bible-zines” that present the Bible in glossy, illustrated magazine packaging. Church-state questions, including controversies over teaching “intelligent design” theories in addition to evolution in schools, came in third with 19 full stories and eight anchor briefs. To round out this portrait of network news coverage of religion, MRC analysts also reviewed prime-time magazine programs (ABC’s Primetime Live and 20/20, CBS’s 60 Minutes, 60 Minutes Wednesday, and 48 Hours, and NBC’s Dateline), ABC’s Nightline in late night, and the Sunday interview shows (ABC’s This Week with George Stephanopoulos, CBS’s Face the Nation, and NBC’s Meet the Press). Since the segments are much longer than the average evening news story and there are almost no anchor briefs, the magazine shows offer the most in-depth coverage of religion news and issues. Nightline, Primetime, and Dateline devoted entire programs to religious topics. In those cases, segments were determined by commercial breaks. Hour-long shows counted as five segments, half-hour Nightline programs as three segments. ABC led with 57 segments, far ahead of NBC with 20, and CBS with 12. Last year, ABC also led with 43 segments, compared to 31 for NBC and just eight on CBS. Among individual programs, Nightline aired 24, Dateline had 19, and all by himself, Peter Jennings did 15 segments in his three-hour special Jesus and Paul: The Word and The Witness. Several of the segments in the count were repeats: thanks to a rebroadcast of 2003's DaVinci Code special, Primetime had 13 segments. All three Sunday-morning shows aired religion segments in the study period, compared to only ABC last year. CBS’s Face the Nation reported on the Pope and interviewed Zbigniew Brzezinski about his personal meetings and conversations with the Pope on February 27. On November 28, both ABC and NBC featured balanced panels of conservative and liberal religious leaders to discuss the trends set in religion and politics by the election returns. While ABC had a balanced and sober panel — evangelical Gary Bauer and Catholic George Weigel on the right, and former Democratic congressman and minister Floyd Flake and Tony Campolo on the left — NBC aimed more for fireworks by including controversial figures and tested TV battlers Jerry Falwell and Al Sharpton (as well as Richard Land on the right and Jim Wallis on the left). Not only did NBC start with a Crossfire-style formula, but Russert threw his typically tough paragraph-length chunks of quotations at Falwell and Land, using dated comments that were widely attacked, such as Falwell’s declaration two days after 9/11 that gays and lesbians and feminists brought an attack from the Almighty. But Russert asked about nothing controversial from his liberal guests. He quoted Wallis’s newspaper ads back to him. He replayed no controversial quotes from the Sharpton playbook, not even his remarks at the 2003 NARAL dinner, proclaiming that the “Christian Right” ought to meet the “right Christians” who favor abortion. In past MRC studies, magazine and interview programs had the most variation in their focus on denominations. For example, while the top three topics in last year’s study were 16 segments on the Catholic church, 15 on The Passion of the Christ, and 14 on evangelical or Protestant churches, this year, only five magazine or interview segments focused on Catholics. The largest category was generic Christianity with a total of 36 segments, beginning with the 15 parts in ABC’s three-hour special on the apostle Paul. Magazine shows did focus on sexual abuse in faiths other than Catholicism during the study period. ABC’s PrimeTime and Dateline NBC each focused on sexual abuse in Amish communities. On CBS’s 60 Minutes, Christiane Amanpour reported on sexual abuse in a Muslim community on the outskirts of Paris. In all these cases, reporters highlighted how young women could be raped, even by family members, and then be shunned if they tried to hold anyone accountable for it. What Stories Did Reporters Want to Skip?